Title of Art Piece: A Change for the Better? 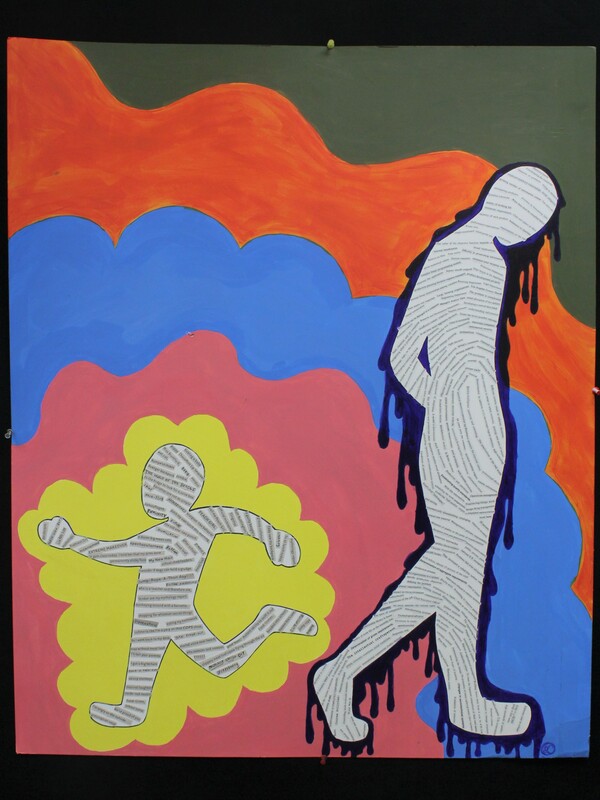 This piece is a commentary on how drastic of a change your life makes as you make your way from childhood to adulthood. This change can be clearly seen in the types of books you read. I chose to take cut outs from books that would represent what the person might care about in the different stages of their life. The cut outs are arranged inside an outline of a person at different stages in their life. The arrangement is in the shape of a thumbprint, my thumbprint to be specific, because this is something very personal but is also a problem every human in existence faces. The child figures body language is carefree while the adult figure is slumped and depressed from the weight of the responsibilities that they now carry. The colors around the child are bright and playful to go with their nature. The adult is dripping a dark purple that represents the troubles and responsibilities that come with being an adult.